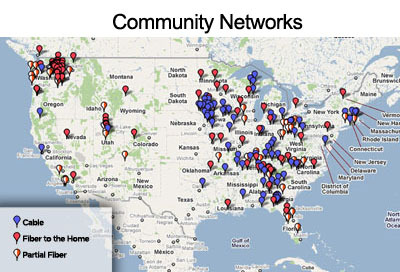 We have long urged the FCC to include community networks in discussions around subjects like Universal Service Fund reform -- where communities are better poised to build the networks they need than private companies. The good news is that the FCC is now listening; the bad news is that they are listening during a short window in the middle of August. Doh! In reforming this portion of the fund the FCC has requested addition information on the idea of communities “self-provisioning” their broadband service. Specifically the Commission is considering requiring all fund recipients to open up their networks to self-provision communities at reasonable rate. Right now this requirement would be limited to self-provisioners that are in areas where USF recipient may have facilities nearby BUT the USF recipient is not providing service to the self-provisioning community. We think that small, independent or community based ISPs are just the kind of folks the FCC envisions to be “self-provisioning” an unserved community. Public Knowledge and the Benton Foundation are working together to document input from current “self-provisioners” to help answer some of the questions in this proceeding. If you are interested in participating you can either file a comment on your own by August 24, 2011 or work with PK and Benton’s attorneys to put together a coordinated filing. Note: You can file confidential information with the FCC in the proceeding using the procedures outlined in this document. If you are interested in working with PK and Benton please answer the following questionnaire with as much detail as possible and email to Amina Fazlullah or John Bergmayer by August 24th 2011. You can now read this post at Huffington Post also. As a condition of its massive merger with NBC, the federal government is requiring Comcast to make affordable Internet connections available to 2.5 million low-income households for the next two years. "Quite frankly, people in lower-income communities, mostly people of color, have such limited access to broadband than people in wealthier communities." This is why so many communities are building their own next-generation networks - they know that these networks are essential for economic development and ensuring everyone has "access to a quality education, quality health care and vocational opportunities." And they know that neither Comcast nor the federal government are going to make the necessary investments. They need a solution for the next 20 years, not just the next 2. During the recent budget negotiations, one plan called for taking valuable wireless spectrum that is intended to be used as a commons and auctioning it off the massive corporations to monopolize. Rather than enabling a whole new generation of wireless technologies that would create countless jobs and ongoing opportunities for innovation (some have described it as Wi-Fi on steroids), it would have created a one-time cash infusion while further consolidating the incomparable market power of AT&T and Verizon. Preserving as much spectrum as possible as unlicensed commons allows communities, small businesses, and activists to build the wireless networks they need because they cannot afford to license spectrum for their sole use. Wally Bowen wrote the following op-ed urging a more sensible approach. Fortunately, the spectrum auction was dropped from the plan - but it will undoubtedly come up again. This was originally published in the Charlotte Observer on July 31 and is reprinted here with permission. U.S. House Republicans are pushing a proposal to sell off some of the nation's most valuable real estate as part of a debt-ceiling deal, apparently unaware of the harm it will do our economy. This real estate is a portion of the public airwaves so valuable that it's been called the "Malibu beachfront" of the electromagnetic spectrum. This lower-frequency spectrum, previously reserved for broadcast radio and TV, is far superior to "Wi-Fi" frequencies used for Internet access - and for innovative devices ranging from microwave ovens and cordless phones to garage-door openers and baby monitors. This prime spectrum can deliver broadband speeds that support high-definition video for telemedicine in rural and other underserved areas. This spectrum is especially plentiful in rural America, and could help connect millions of low-income citizens to affordable broadband services. It could also spark a new wave of high-tech innovation and job-creation far greater than the Wi-Fi boom of the last 25 years. These disagreements are hopelessly tangled in another argument entirely: What role should the government have in any market, let alone the broadband market? North Carolina’s state legislature just passed a law prohibiting municipal broadband services. But in the communications industry, many free-market and anti-regulatory arguments would be mooted if the market provided what is being asked for – affordable and universal access to broadband. Now, not later. Communities are not building their own networks on a lark - they do it because they have to in order to ensure their future vitality. Just last week, we also answered the same question of the role of government in broadband when revisiting an excellent commentary published years ago about the proper role of government in matters of infrastructure. We will all benefit the most when we all have access to fast, affordable, and reliable access to the Internet. But blindly relying on a few massive companies to get us there is lunacy. They simply do not have the motivation or capacity to sufficiently invest or to run the networks in such a way that all have access -- as private companies, they are supposed to maximize profit. Maximizing profit is incompatible with managing infrastructure -- pricing access to infrastructure too high results in losses for everyone, including the vast majority of the private sector. At the very least, all communities must maintain the freedom to choose locally if building a network is the right decision for them. When Verizon won an auction to use the 700MHz band of the spectrum to deliver mobile broadband, it promised to adhere to a set of openness rules that included allowing customers to use applications and devices of their choosing. But Verizon is now blocking "tethering" apps that allow us to use our cell phones as a modem for our computers. Whether it's legal for a wireless carrier to cripple tethering services is unclear. Verizon agreed to follow open Internet principles as a condition of acquiring the spectrum that it uses for 4G wireless phones. One interpretation of that condition is that the company shouldn't attempt to restrict tethering on its 4G network -- though apparently it's still free to do so on the 3G network. But aside from neutrality issues, Verizon's move clearly seems hard to justify from a pricing standpoint. Given that the company is already going to charge new users based on the amount of data they consume, there's no reason for it to also impose a surcharge for tethering. Free Press will file a complaint today with the Federal Communications Commission against Verizon for violating the rules that govern the licenses for its LTE network. Licensees of the C Block of the upper 700 MHz block, over which Verizon runs its LTE network, may not “deny, limit, or restrict” the ability of their customers to use the applications or devices of the customers’ choosing. We watch in frustration as the federal government, dressed as Charlie Brown asks AT&T, wearing Lucy's blue dress and smiling brightly, if she really will hold the football properly this time. "Oh yes, Charlie, this time I really will create all those jobs if you let us buy T-Mobile," says AT&T Lucy. Over at HuffPo, Art Brodsky recently revisited AT&T's promises in California to create jobs, lower broadband prices, and heal the infirm if the state would just deregulate the cable video market -- which it did, 4 years ago. California upheld its end of the bargain -- wanna guess if AT&T did? Hint: Charlie Brown ended up on his back then too. "AT&T and Verizon have slashed the frontline workforce, and there simply are not enough technicians available to restore service in a timely manner, nor enough customer service representatives to take customers' calls. Let me share some statistics. Since 2004, AT&T reduced its California landline frontline workforce by 40%, from about 29,900 workers to fewer than 18,000 today. The company will tell you that they need fewer wireline employees because customers have cut the cord going wireless or switched to another provider, but over this same period, AT&T access line loss has been just under nine percent nationally. I would be shocked if line loss in California corresponds to the 40 percent reduction in frontline employees. "Similarly, since 2006 Verizon California cut its frontline landline workforce by one-third, from more than 7,000 in 2005 to about 4,700 today. I venture that Verizon has not lost one third of its land lines in the state." Note that AT&T, Verizon, and other massive incumbents like Comcast have been wildly profitable over this term. A friend once told me about his battle with the local government over whether it would charge him a fee for inspecting the house he wanted to begin renting out (he had bought another house but didn't want to sell the first in a down market). His house was well maintained and he said he would be happy to schedule the inspection whenever convenient for the City but absolutely would not pay a fee so they could inspect his house. Consider this from a different perspective. The local government should make sure that rental properties meet certain standards (building and fire codes if nothing else). This means inspections. Who should pay for the inspections? It boils down to two choices: the property owner or the tax-base at large. It seems more fair to charge property owners at least a portion of the cost as they benefit the most from being able to rent out their property. I make this point to lead into another discussion about managing the Right-of-Way (ROW), the city-owned property used for utilities. An article in TribLive about a town near Pittsburgh fighting to keep its cable fees offers insight into a national discussion about fees for using the ROW. Hempfield charges utilities $750 for a right-of-way permit, $500 for a renewal, and $250 for a construction permit, according to a township ordinance. Ferguson said without the fees, the township would not be able to monitor the work. "We use the monies, those permit fees, to pay staff to make sure they repair roads as they're supposed to," Ferguson said. "Part of the fee is ... for our inspectors to go out and make sure they (utilities) complete the job right." Ferguson said utility companies sometimes dig up new roads to install or repair lines and leave the road in shambles afterward. "Taxpayers should not be required to pay the staff to make sure utility companies do the right thing," he said. We at the Institute for Local Self-Reliance signed on to a letter organized by our friends at the Media Action Grassroots Network asking the FCC and Department of Justice to thoroughly review AT&T's proposed takeover of T-Mobile -- read the press release. “Our communities cannot afford higher prices and less choices. We need the FCC and DOJ to block this takeover if it's found to be in violation of antitrust law and does not meet public interest obligations,” said Betty Yu, National Organizer for MAG-Net. The groups also contend the takeover will disproportionately harm consumers of color, who rely on their cell phones to access the Internet more than whites. While 10 percent of whites access the Internet only from their phones, 18 percent of blacks and 16 percent of English-speaking Latinos depend on affordable wireless coverage to get online. The impact that this merger would have on affordable mobile phone service, broadband access and adoption, openness on the mobile web and broadband competition presents a real threat to our communities. We hope that the Department of Justice and Federal Communications Commission will examine AT&T's proposed acquisition of T-Mobile with appropriate scrutiny and protect our communities by blocking this merger. We intend to host a series of open and participatory meetings in our communities to discuss this merger, and we hope that FCC Commissioners will commit to joining us. It is only by communicating directly with people and hearing our stories that you will feel our deep concerns with this merger and the devastating impact it would have on our communities.